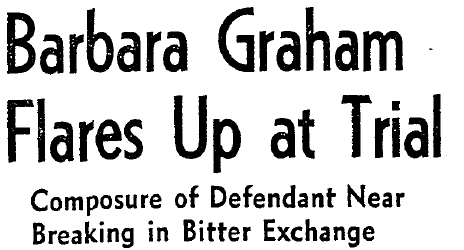 On this date in 1955, Barbara Graham was gassed at California’s San Quentin Prison, along with two confederates in the brutal murder of an elderly widow. Following the classic sob-story vector from orphan to juvenile delinquent to petty criminal, Graham found her calling as femme fatale. She entered adulthood with World War II, and spent the war years alternating between failed marriages and the working-girl beat for Pacific military bases. Police made a bigger deal of perjury when she unwisely tried to help out some underworld friends by swearing to a demonstrably bogus alibi for them. She did some real time, tried to go straight in a boring Nevada town, and inevitably — for the likes of this site — returned to the siren lures of California. It was back to the familiar job servicing the familiar hunger … but now with a new hunger of her own: heroin. And heroin meant a now-ravenous appetite for cash. 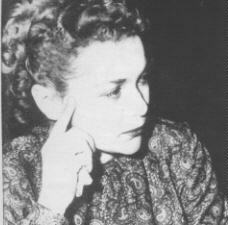 Barbara Graham’s trip to the gas chamber and to California crime history began when she and some fellow-addicts tried to satiate that latter craving by burgling the Burbank home of Mabel Monohan, who was rumored to live alone with a lot of portable valuables. The job was a botch from beginning to end: someone bludgeoned the crippled woman to death, but nobody found the supposed boodle. And as the police investigation led back towards the culprits, two of them flipped on their confederates. Shock murder authored by vamp courtesan? (The informant would testify that Graham personally pistol-whipped the victim into a bloody heap.) Hellooooo, California noir. Two years in prison waiting for death have taken their toll of the once attractive convicted murderess. Her reddish-blond hair has reverted to its natural black color. She has lost about 30 pounds. She is gaunt, tense and near hysteria. Graham’s persistence with a decreasingly plausible innocence story similarly amplified the pathos of her situation. It also set up a highly sympathetic post-execution cinematic portrayal, the 1958 I Want to Live! — which garnered leading lady Susan Hayward an Oscar for Best Actress. Director Robert Wise actually personally witnessed the real Graham’s gassing as part of his research for the film. A 1983 television remake starred former Bionic Woman Lindsay Wagner. Caryl Chessman, guilty of his crime or not, was not on trial for/convicted of murder, which may be why he had a lot more backing from the “”movie stars” when it came to his execution (a fat lot of good that did him). I’m afraid that link rot is a frequent problem as posts age. I don’t make a point of maintaining original copies of resources I link to. You might try copying the link address and dropping it into archive.org to see if they crawled a snapshot of it, and/or google searching the exact quote that I used in case it’s been reposted elsewhere. Any way you can provide that, via email, or repair, etc? I saw the movie several time and it reeks of entrapment and the guy who walked seem to be the only one of the men who could have bear/killed the elderly lady The Police back then wee r bullies and seems like it was an easy verdict for them to reach Barbara had a lot of little crimes but nothing violent the Reporter who told the story finally believed her innocence. Her husband a drug addict couldn’t remember if he was with her that night and I thought she didn’t do drugs as told in the movie. where were all the Movie stars that later kept Carroll Chessman alive for 12 years and he was guilty. Guess she wasn’t up to their standards like how they support the Cop Killer who killed a Philly Cop The whole trial and verdict was manufactured and until the last Attorney & Reporter she had no really helpful representation Her son should the State of California! Forget the movie. They didn’t show the evidence that the jury saw. In fact, despite the claim made at the beginning and end, the movie was pretty much fictional except for the names of the criminals and their victim. Here is just one example: According to a police investigator, they didn’t catch her trying to visit her kid. They caught her by keeping her known heroin suppliers under surveillance. It didn’t take long to catch her visiting one. 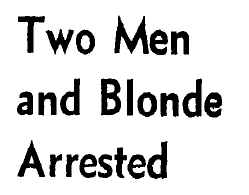 And the scene where the three were arrested was a real hoot. Read about it some time–the movie couldn’t have got it more wrong if they’d tried. You can easily find it on the internet from several sources.